Stephen Schwartz has been around a long time; long enough to have written music for Godspell, Pocahontas, The Hunchback of Notre Dame, Enchanted and a dozen other successful stage and movie musicals. So when he decided to stage Gregory Maguire’s reinvisioning of The Wizard of Oz from the perspective of the two witches, the cognoscenti were agog with anticipation. 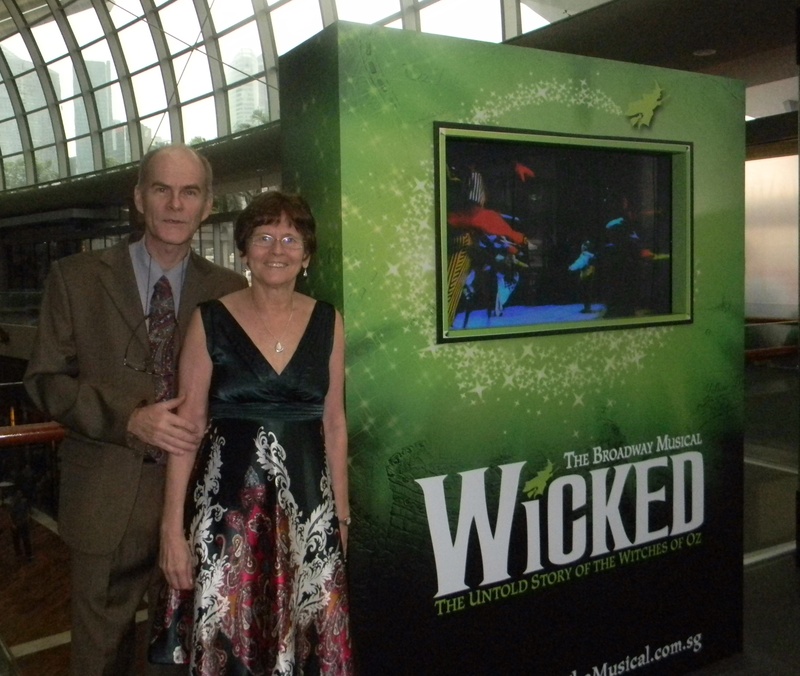 They were not disappointed; Wicked has broken box office records all around the world. Eight years after its opening in New York the musical has finally arrived in Singapore, and last night we went to see it. As far as our attendance at musicals go, it has been a long dry spell for both of us. We did see Chicago a couple of years back when it hit the cinemas, but the last live show we saw was Phantom of the Opera in Toronto as a present for our daughter’s thirteen birthday. Phantom was great show, but plot-wise there really wasn’t much to the story. The Wizard of Oz, on the other hand, was already a great story. But once you start to add layers of plot nuance and character twist, as Schwartz does, it becomes a narrative feast. Add to that some delightfully whimsical costumes, a darkly rich set, some imaginative choreography and the music of arguably the best lyricist on the planet, and you have a spectacular show. We loved every lyrical minute. We also loved the setting along the south side of Marina Bay. 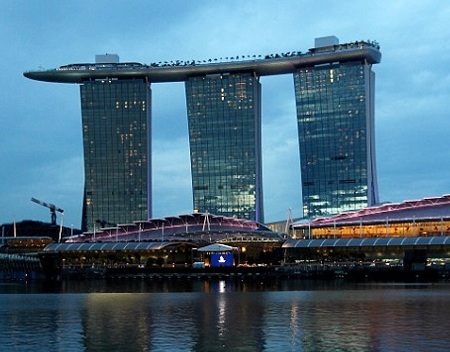 There is a fabulous new hotel there, The Sands, with its boat like upper deck, and lovely new mall on the ground levels with walkways and vistas of this increasingly beautiful city. We sat and soaked in the casual ambience for a while before we went for dinner at Sky 57. Dinner was a hoot. We decided we would go for a sampling of the chef’s special courses and we agreed that we would split a portion as neither of us was particularly hungry. It is good thing we weren’t, for none of the courses would have satisfied the hunger of a three year old child. The potatoes that came with the lamb were particularly notable. They were cut so small that it would have taken a dozen or more to fill a teaspoon. Which would have been fine except the portion was less than that, perhaps five or six of these little things. Admittedly they were tasty. Briefly. The same could be said for the soup. It was delicious for the three spoonfuls they presented us in an enormously oversized bowl. And on it went. If it weren’t for the endless supply of rolls we would have both left hungry. But I am being unkind. The service was lovely and the view of the city unmatched­­. The company was delightful and the occasion – Pam’s birthday – was special to both of us. We drank it all in, laughed as decorously as civility allowed at all the silly miniscule servings, and generally had a very happy time together. Oh yes. There was the matter of the gift. Perhaps Pam will have the opportunity to wear it sometime soon and you may see it for yourself! What a lovely, exotic way to celebrate your special birthday…it will be one you won’t forget! You looked beautiful Pam in your colourful dress and sparkling jewellery…can’t wait to hear and see what the gift was! You’ve come a long way from celebrating birthdays on the miniature golf course in London!! And that’s all I’m going to say about that! !